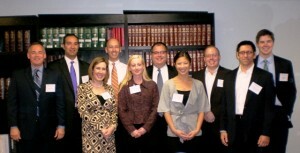 Legal Aid marked the incredible success of its 2009 Generous Associates Campaign by hosting a breakfast for the Co-Chairs and Coordinators from the various law firms that participated. The atmosphere was incredibly upbeat as we celebrated the tremendous results of this summer’s campaign that raised over $675,000. Thank you to everyone who participated in this year’s Generous Associates Campaign – the Firm Coordinators, the Campaign Co-Chairs, and their colleagues and firms who gave so generously. This incredible outpouring of support from the legal community never ceases to amaze us each year. I know that I speak for my colleagues, the board, and most importantly, the clients we serve, when I say we are extremely grateful.